Blooming habit at San Vicente, Tamaulipas, Mexico. 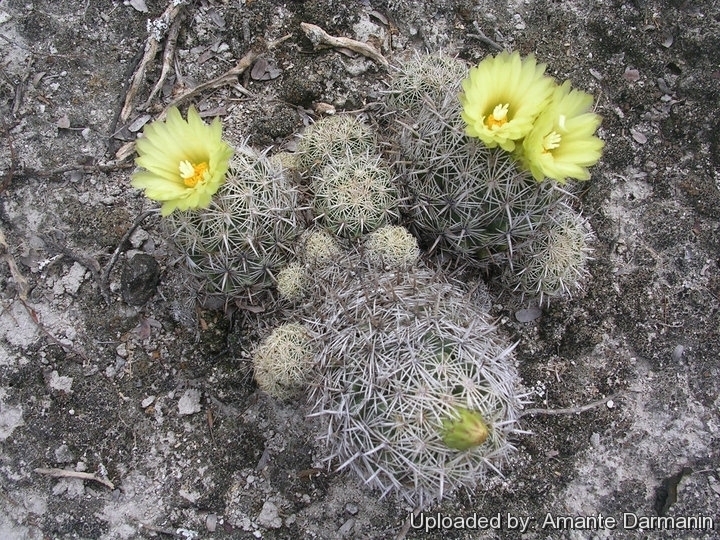 Origin and Habitat: Coryphantha difficilis grows in the Mexican state of Coahuila in the area around the Sierra de la Paila in Coahuila State (Hipolito, La Paila, La Rosa, El Sacrificio, Casas Coloradas, Las Imagines, Las Palomas, Parrial de la Paila, Zona de Minas, Mount Paila, Saltillo, Laguna de Meyran, San Ildefonso, San Jose de la Paila, Estacion Marte, Sierra los Alamitos and adjacent localities). There are supposedly reports of the species from the United States (Texas and Arizona) that require confirmation. Although this species has a more restricted range than other species, the extent of occurrence is still well over 20,000 km². Subpopulations are fairly scattered, but it is common where it occurs. Altitude range: 1000-1750 metres above sea level. Habitat and Ecology: This cactus grows as solitary plants in shrubland on alluvial plains and in limestone gravel on the slopes of the Sierra Paila. 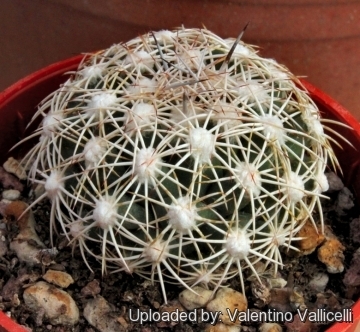 Accompanying cactus and succulent species can be Mammillaria chica, Mammillaria grusonii, Opuntia imbricata, Epithelantha micromeris v. gregii, Hamatocactus hamatacanthus, Coryphantha valida, Ariocarpus kotschoubeyanus. There are no major threats, although some subpopulations are declining due to trampling by goats. Stem: Mostly solitary, spherical to short cylindrical flat or slightly depressed on the top, white-woolly, bluish-grey-green to dull green, up to 8-14 cm tall, 5-8 cm in diameter. Tubercles: In 8 and 13 series, flattened broad-conical, appressed, oblique and their outer end points outwards, upper surface grooved. Axils white-woolly. Areoles: Round, 3 mm diameter, white-woolly in youth. Central spines: 0-4(-6) , the three lower ones spreading, porrect, curved downwards, strong, subulate, the upper one slightly curved, protruding, thinner, all 16-20 mm long, in new growth brown, darker towards the tips, later turning grey from the base. Flowers: The flowers are large, funnel-shaped, 6-8 cm diameter, purely yellow, without any red in the throat. Filaments shiny yellow, anthers yellowish, stigma yellowish with 7-8 whitish lobes. Fruit (berry): Roundish, green, juicy 18 mm long, 14 mm diameter with attached flower remnants. 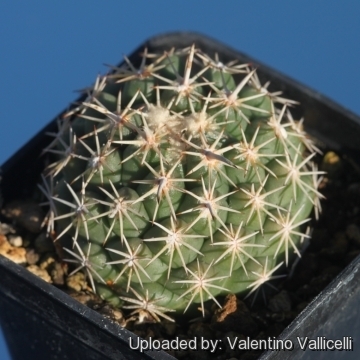 Remarks: This species is somehow variable in habitat and intergrades and is sympatric with Coryphantha salinensis. 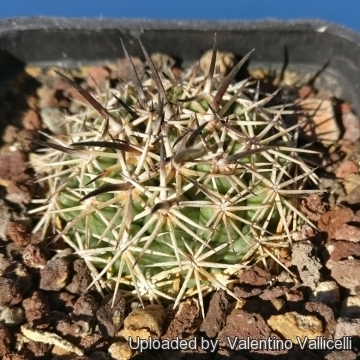 Coryphantha densispina Werdermann in Fedde, Rep. 30:57, 1932 has been allocated to Coryphantha werdermannii by several authors. Hence, the described tubercle form and size correspond to Coryphantha. 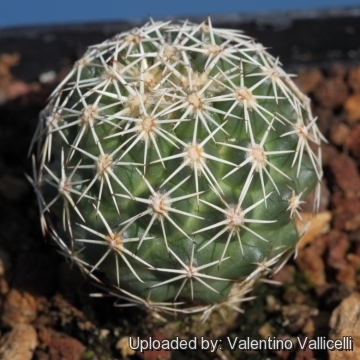 The name-giving density of spination is reminiscent of Coryphantha werdermannii, but is also well-known in Coryphantha difficilis from locations at higher sealevels. 1) Gómez-Hinostrosa, C., Hernández, H.M., Lüthy, A.D. & Dicht, R.F. 2013. 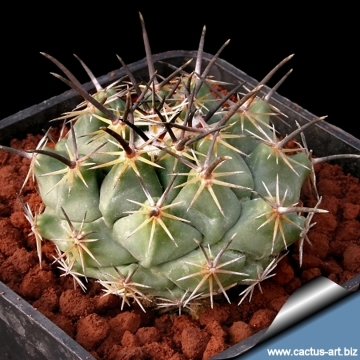 Coryphantha difficilis. The IUCN Red List of Threatened Species. Version 2015.2. <www.iucnredlist.org>. Downloaded on 19 July 2015. 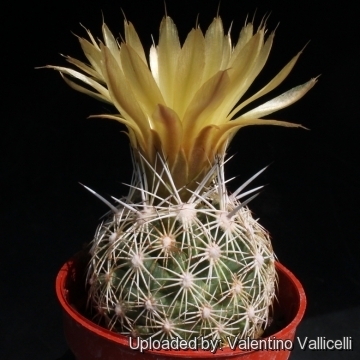 5) Reto Dicht, Adrian Lüthy "Coryphantha: Cacti of Mexico and Southern USA" Springer Science & Business Media, 14 March 2006. Cultivation and Propagation: In culture, contrary to its name "difficilis" (difficult) this species does not show special problems, but it is very slow-growing. In Coryphantha difficilis the observation of the plant development from radial spined youth-forms to the definite, wildly spined outlook is particularly interesting.